This is the first year we'll be celebrating Michaelmas, and I am very excited about adding this celebration to our year! We are currently in the middle of a language arts block, so I'm weaving it in to our circles and main lessons. The kids really thrive on stories, so they have been the main focus of all our circles so far this year, and the stories of Saint Michael and George and the Dragon are such great stories I really couldn't wait for the end of September to get here. Saint Michael is known as the Saint who conquered the "dragon" in heaven, a saint who gives strength to people, and a Saint who represent victory over evil. Some stories say during his battle, he banishes the dragon from heaven, and the dragon falls to earth. Michael then creates an earthly body of his spirit in George to fight the dragon on earth and protect the people from evil. I love the focus on conquering the dragon, celebrating inner courage and strength. During the week we will be focusing on identifying some of our personal dragons and how we can overcome them. On the feast day, September 29th, we will have a small knighting ceremony to celebrate conquering our "dragons". I couldn't find any stories that had both stories woven together, so I had to create my own. I found some inspiration from this free ebook on waldorflibrary.org . It has a few nice stories to tell young children. I find they really focus on harvest, and less so on courage and bravery, so I really just took snippets and ideas to weave my own story together. 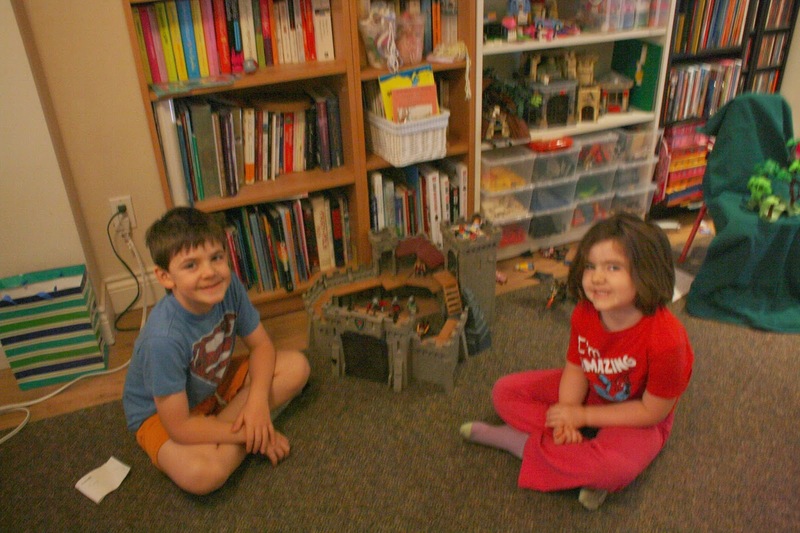 The kids came inside from their outdoor time early and were super excited to jump in to the new set up! The props stay out and the children play with them reenacting the story all week long. We don't have a nature or seasonal table, so this is my compromise. Mondays used to be a drag to get back in to our rhythm, but now they wake up excited about the prospect of a new story for the week. I used a variety of the toys we had at home as props, but I did purchase a dragon because the one I attempted to make just wasn't cutting it. The villagers hiding from the dragon in the castle. George and the princess battling the dragon. George getting knighted by Saint Michael for his kindness, courage and bravery. When Saint Michael knights George, I taught the children our verse for the week and introduced it to them as the Knights Oath. For main lesson work we moved to the table and drew shields with the oath written on them. My kindergartener really wanted to write the words herself, and I was really impressed with her attempt! My second grader wrote the entire poem, but was thrown by the shape of the shield, so it came out a bit jumbled. He is currently working on re-doing it on a larger piece of paper, because he isn't happy with the final main lesson book product. But for a kid who has really weak fine motor skills, I'm pretty proud he persevered through the poem, without complaint. Typically he does a picture summary of the story we are focusing on and then prints a written summary a few sentences long (not copy work, his own original sentences describing his picture.) I hadn't planned on the summary work today, mostly because I knew there was a lot of work in the shield and verse, but he still really wanted to draw a picture. Michael and George conquering the dragon. The kids were very excited about this story and played with the props all afternoon. I am really looking forward to focusing on building our character through this story and working on some inner dragons. The children really connected with that theme of the tale, which actually surprised me a bit. I thought it would be all knights and dragons and battles that would stay as their focus. Tomorrow I will post the story I told, in case anyone else wants a story with a bit of a different take. What will you be doing to prepare for the Feast of Saint Michael? Thanks for sharing. Today was our very first day celebrating (our version of) Michaelmas. I told Vi the story in that ebook you posted, but weaved in a few details of my own. Vi was much, much more impressed with the princess and not the knight from heavens. She said she had never seen a fire-breathing dragon, and that she wished to meet one one day to see if she'd be afraid or not. She said she thought she wouldn't be afraid. She clearly was relieved that the princess was safe and sound after all. I had intentionally put the emphasis on the bravery of the princess because it's not to say Vi is not brave - she is in many ways - but in certain things she's over-cautious and does not venture. Anyway, she apparently enjoyed the story very much and after story time, went ahead and drew a picture of it all. It's our music and cooking day so that was it for Michaelmas, but I look forward to Wednesday.